Beatrice's Goat is a moving picture book tells the story of how the lives of one poor family in Africa were dramatically improved by the simple gift of a goat from a generous stranger and a charitable organization named Heifer Project. Beatrice desperately wants to go to school, but her family cannot afford it. Instead, she spends her days caring for her younger siblings and helping in the fields on their small plot of land in a rural African village. 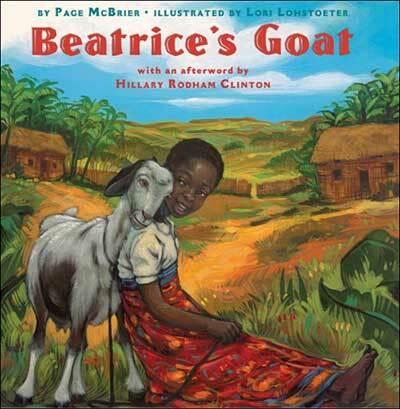 Then one day, Beatrice's family receives a precious gift from a charity--a goat! In time, the goat provides milk to sell as well as baby goats, and soon the family has earned enough money so Beatrice can go to school. Beatrice's Goat is illustrated with vibrant acrylic paintings that powerfully depict the culture, environment, and poverty of the African landscape. Based on the work of the nonprofit organization Heifer Project, this story shows how a small act of generosity can make a big difference in the lives of others, particularly those living in impoverished conditions here or abroad. For kids in first to third grade, this book will need to be a read-aloud rather than for individual reading, as children generally do not read on the reading level (difficulty level) of this book until the end of third grade. The majority of fourth and fifth graders should be able to read this book independently. Below are two spreads from the beginning of Beatrice's Goat. As you can see, the illustrations are lush and depict village life in a tropical African locale. There is quite a bit of text in this story and I was initially worried that my class of first graders wouldn't be able to sit through it. Wow was I wrong. They were riveted throughout the story and even talked about Beatrice periodically for days afterward. It made quite an impression! Here are two additional spreads. This first spread depicts Beatrice and her distraught mother who knows she must tell Beatrice that they do not have enough money to send her to school. The second spread shows young Beatrice watching the class from a distance, fearing "I'll never be able to go to school." I started the unit by reading Beatrice's Goat. The kids were very tuned in! Then I showed pictures from National Geographic of houses (basically shacks) and dilapidated schools in developing countries and we discussed the ways in which the lives of the very poor in other countries might differ from our lives here. Then we watched short, kid-focused video clips from the Heifer website (find them here) about the different animals that can be given and how the animal will benefit the family that receives it. At that point the kids were really excited! It was such a sweet, wonderful experience. 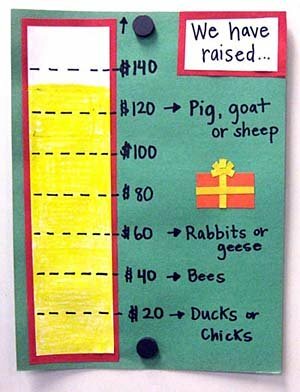 Kids are fantastically generous. I think the book was an important component of our success based on how many times kids mentioned Beatrice! Want to save 50% or more off retail? 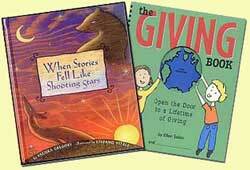 We sell a range of character education kids books that are used but still in great shape! Perfect for teachers and parents.